We will be closed on Friday, July 4, to celebrate Independence Day. This is a short newsletter to highlight some great classes coming up soon. 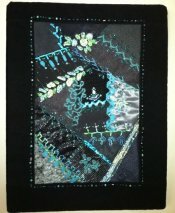 Janet Paehlig will be teaching her popular "Beading on Fabric" class this coming Saturday, June 21, and there are still some spaces left. Please call by tomorrow, June 19, before noon to sign up so Janet can get kits and handouts ready for everyone. Janet has her beautiful beads and fibers in Thistle Dew's classroom now, so even if you can't take her class, come in and shop for some wonderful embellishments. Handwork Sit & Sew-Monday. There will be mo meetings of this group in May or June. BOM-House Warming Party, Thu, June 19, 6:00 - 7:00 p.m.
Blankets for Preemies, Fri, June 20, 11:00 a.m. - 3:00 p.m.
American Girl Doll Sit & Sew, Wed, June 25, 1:00 - 4:00 p.m.
BOM-Anniversary Waltz, Thu, July 3, 10:30 - 11:30 a.m. -OR- 5:30 - 6:30 p.m.
Imperial Blooms, Tue, July 8, -OR- Sat, July 26, 1:30 - 4:30 p.m.
Spoolin' Around, Judy Cummings, Mon, Jul 14, Aug 11, Sep 8, 9:00 a.m. - Noon -OR- 1:00 - 4:00 p.m., $45 for series, supply list. 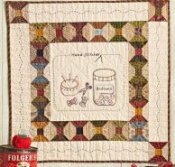 Join Judy for another fun hand work class and make this lovely sewing-themed hand-pieced and embroidered wallhanging designed by Cindy Blackberg. This piece is featured in the June 2014 issue of American Patchwork & Quilting!